Lou Patten, former Tennessee state senator. The Ocoee River Olympic course in use. The events on the Ocoee River were remarkable in several respects. Although whitewater canoe and kayak races are now commonly accepted as Olympic events, the 1996 Olympics represented only the third time that they had ever been included. They were the first and only Olympic events ever held in Tennessee. And they were the only time Olympic whitewater canoe and kayak races were held on a ‘natural’ river as opposed to a specially-created course. However, like a trip down that Ocoee River course, moving from the idea of holding the whitewater competition there to winning international praise for the successful execution of those events was a wild and sometimes bumpy experience. The effort began almost a decade beforehand, when Atlanta decided to launch its bid to become a host city for the Olympics in 1987. At the time, the Georgia city seemed like a longshot candidate. The Summer Olympics had been held in an American city - Los Angeles – in 1984. Many people assumed the games wouldn’t return to the United States so soon after that. Also, the 1996 games would be celebrating the 100th anniversary of the modern Olympics. That made Athens, Greece, the birthplace of the Olympics, a sentimental choice to host that year. 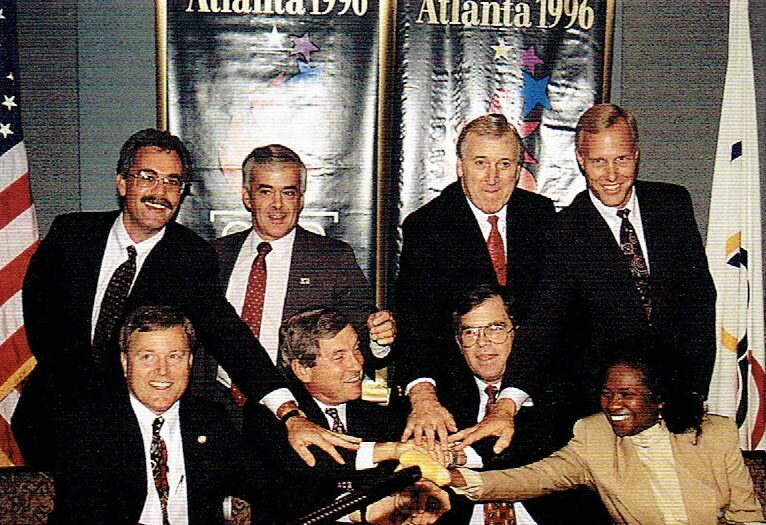 However, after five rounds of secret balloting in 1990, the International Olympic Committee announced Atlanta as the host city. 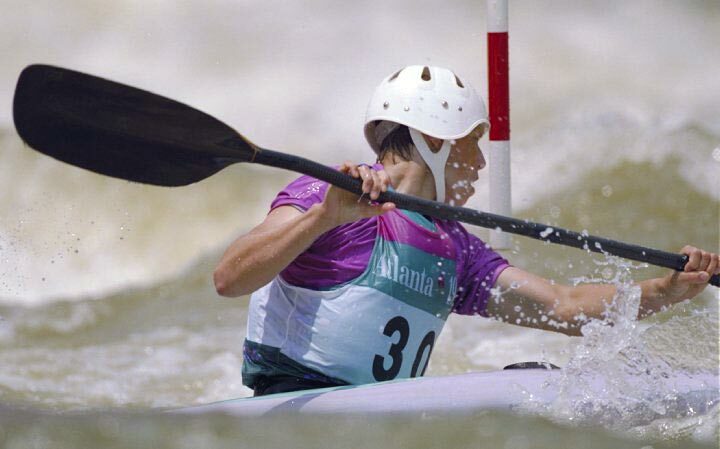 At the same time Atlanta was preparing its bid, a group of avid whitewater racers from the Atlanta area were determined that whitewater slalom racing would return to the Olympics if Atlanta won the bid. Those racers were active in a group called Atlanta Center for Excellence, one of several training centers in the United States for whitewater racers. Three of the group’s members – Mike Larimar, Don Giddens and Tim Kelly – approached Joellen Dickey, who was also living in Atlanta at the time. They said the Ocoee River’s reputation with whitewater enthusiasts made it an obvious choice for the whitewater venue. Not everyone was immediately sold on the idea. J.T. Lemons, who owns a rafting outfitting business along the Ocoee, said some people in his line of work were skeptical in the beginning. Dickey said the United States Canoe and Kayak Team, the governing body for canoe and kayak racing, also had some reservations. The team had been focused on developing its flatwater racing program, so some people on the team worried about diverting resources into whitewater events. 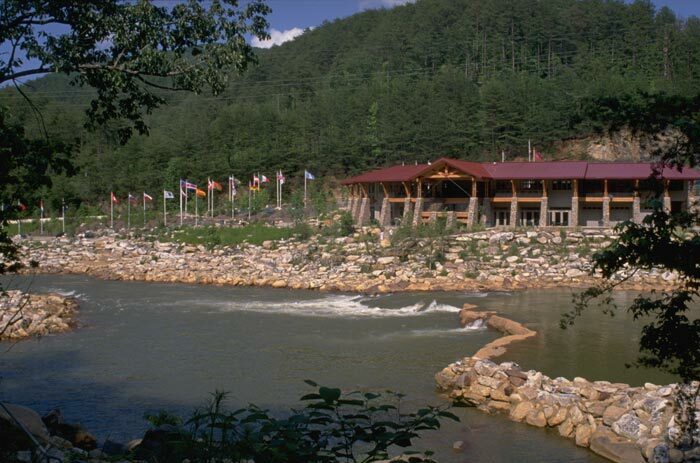 Slowly, however, a groundswell of support began to build for the 1996 Olympics to include whitewater events on the Ocoee. Many saw the Olympics as an opportunity to bring economic development to an area that had been struggling to reinvent itself ever since the copper mining industry in Polk County had begun to decline nearly a century earlier. Lou Patten, at the time a state senator from Bradley County, remembers much discussion about the idea at a meeting of rafting outfitters. Patten saw the potential economic value of hosting the events. Lou Patten, at the time a state senator who represented the area, remembers Dickey’s father approached him at a meeting of the rafting business owners dedicated to other items of business. After Dickey’s father raised the issue of hosting the Olympic events, Patten saw the potential economic value. Local, state and federal officials meet with a representative from the Atlanta Committee for the Olympic Games to sign the contract to hold the 1996 Olympic whitewater events on the Ocoee River. Besides galvanizing support from the local business owners and canoeing and kayaking enthusiasts, there were a number of other obstacles to overcome. At the time, whitewater racing events weren’t firmly established as part of the Olympics. 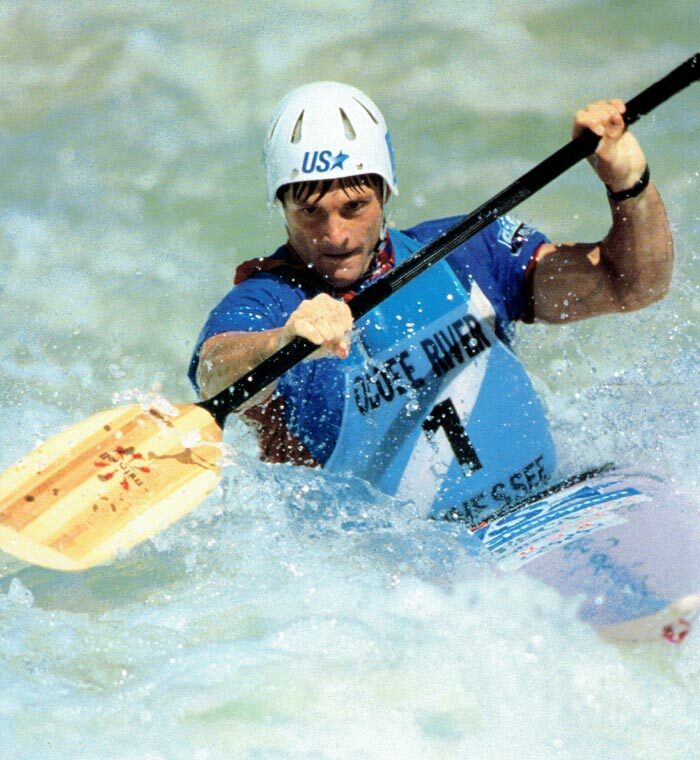 Whitewater racing had been part of the Olympics the first and only time in 1972 in Augsburg, Germany, where U.S. paddler Jamie McEwan won a bronze medal. Although those events were back on the program for the 1992 Olympics in Barcelona, there were no guarantees for whitewater to be included after that year. Bill Endicott, a longtime paddler and coach of the U.S. whitewater slalom team from 1977 to 1992, became a consultant for those involved with the Ocoee River bid. Endicott said the International Olympic Committee left it up to the discretion of the host cities to determine whether or not they wanted to include the whitewater events. Most at the time didn’t. “For 20 years, no one wanted to pay to build an artificial river to host the slalom events,” Endicott said. Atlanta officials, faced with numerous other costs associated with hosting the games, were in a similar posture. “It wasn’t something we had to do,” said Charlie Battle, who served on the Atlanta Committee for the Olympic Games, known as ACOG. But Atlanta was willing to consider adding whitewater events, provided someone else was willing to pay for the course and the other expected costs. When Atlanta submitted its bid, the canoe and kayak slalom events were listed as “optional,” pending the International Olympic Committee’s approval. In a Nov. 13, 1991 memo found in Tennessee Gov. Ned McWherter’s papers at the Tennessee State Library and Archives, Chattanooga attorney Whitney Durand said that Juan Samaranche, chairman of the International Olympic Committee, was opposed to including whitewater events in 1996. It’s not known why Samaranche opposed inclusion of the whitewater events. Paul Wright, a U.S. Forest Service employee who became project director for the construction of the Ocoee venue, said there was a sense early on that Atlanta’s support for the project was lukewarm at best. The grassroots group lobbying for the Olympic events – called Whitewater in Ninety-Six or WIN – wasn’t deterred. Tim Kelly, one of the group’s members, was an accountant with KPMG Peat Marwick who convinced his firm to conduct a feasibility study to weigh the project’s expected costs against its benefits. That study would later prove to be pivotal in solidifying support among various groups that had expressed interest in holding the events on the Ocoee. In 1993, Joellen Dickey and others formed a nonprofit business called the Ocoee Region Canoe and Kayak Association (ORCKA) to finance and host international events on the Ocoee River prior to 1996 to train volunteers and build support for the Olympic bid. The organization won a bid to host the 1993 world cup there, giving international athletes their first experience on the Ocoee. The Ocoee River location had some drawbacks working against it. The proposed course site was a two-hour drive from Atlanta. While it’s not unprecedented for some Olympic events to be held so far outside the host city, it was a bit unusual. Also, the proposed location was in the Cherokee National Forest, a remote area with very little of the infrastructure needed to host a major sporting event. Cleveland, the nearest city capable of assisting with many of the needed resources was along the route, but almost 30 miles away. Once it overcame its initial reluctance about getting involved, the U.S. Canoe and Kayak Association approached Governor McWherter about spearheading the effort. 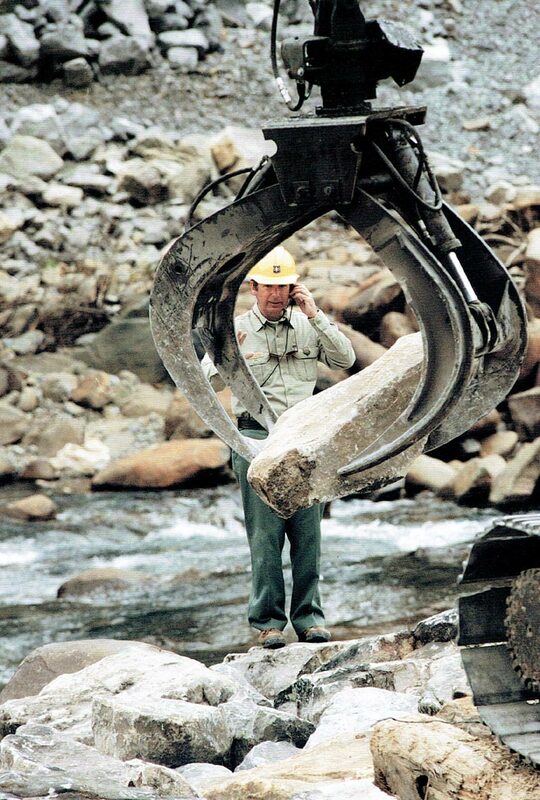 Bill Peach, project manager for the U.S. Forest Service Olympic project, oversees placement of a six-ton boulder. Also, the proposed location was in the Cherokee National Forest, a remote area with very little of the infrastructure needed to host a major sporting event. Cleveland, the nearest city, was almost 30 miles away. Once it overcame its initial reluctance about getting involved, the U.S. Canoe and Kayak Team and the WIN grassroots group approached Governor McWherter about spearheading the effort. Pam Inman, who was assistant commissioner of the Tennessee Department of Tourism at the time, said the idea didn’t initially have universal support from state officials. Even after the governor’s office got involved, Atlanta officials didn’t seem convinced Tennessee was willing to make the necessary financial commitments. Michael Pinkerton, vice president of sports programme for the Atlanta Committee for the Olympic Games (ACOG), fired off a letter to Jim Hall, McWherter’s special assistant, on September 17, 1991, suggesting that Tennessee had missed a critical deadline by not committing to funding by the previous April. “Because we had no assurance that the event would be financed outside of ACOG’s budget, ACOG could not support the inclusion of Whitewater Slalom,” Pinkerton wrote. As a result, Pinkerton continued, the IOC hadn’t voted to include the events. While Pinkerton said Atlanta was willing to bring the matter back before the IOC if the funding could be secured within a year, he didn’t hold out much hope for Tennessee’s chances. In a reply to Pinkerton 10 days later, Hall said the state was waiting on the results of KPMG’s feasibility study on the project, which was almost complete. When it was finished, the feasibility study got the attention of many of the parties that would need to be involved in the effort. That study estimated the project’s costs at $13.5 million – far less than the expected benefits. According to the study, the Olympic project was likely to generate $63.3 million in direct and indirect spending between 1993 and 1997, creating 356 jobs. For Polk County, whose largest manufacturer at the time employed 385 people, those numbers were significant. The media exposure from the events was expected to attract more rafters to the region after the Olympics had ended, generating more visitor spending in the area. Before the Forest Service could fully commit to the project, Wright said a thorough environmental impact study had to be completed to ensure the river and surrounding forest wouldn’t be damaged by construction of the facilities needed to support the event. Wright said such studies often take months or even years, but the one for the Olympic project was put on an accelerated schedule and planning work began while officials were waiting on the results of that study. The environmental impact study included a public comment period for people to offer their input about the project. Wright said the Sierra Club’s Tennessee chapter could have delayed the process by filing a legal challenge, but didn’t. State officials were also impressed enough by the KPMG feasibility study to pledge their financial support. But it wasn’t until July of 1992 that Atlanta formally accepted Tennessee’s proposal – and it wasn’t until December of 1992 that the International Olympic Committee voted to add canoe and kayak events to the 1996 Olympics. The International Olympic Committee announced its decision on the same day ORCKA was hosting a fundraiser to seek corporate sponsors for the 1993 whitewater world cup, a turn of events that Dickey described as serendipitous. It quickly became apparent that bringing the Olympics to East Tennessee was going to require the cooperation of many different groups. 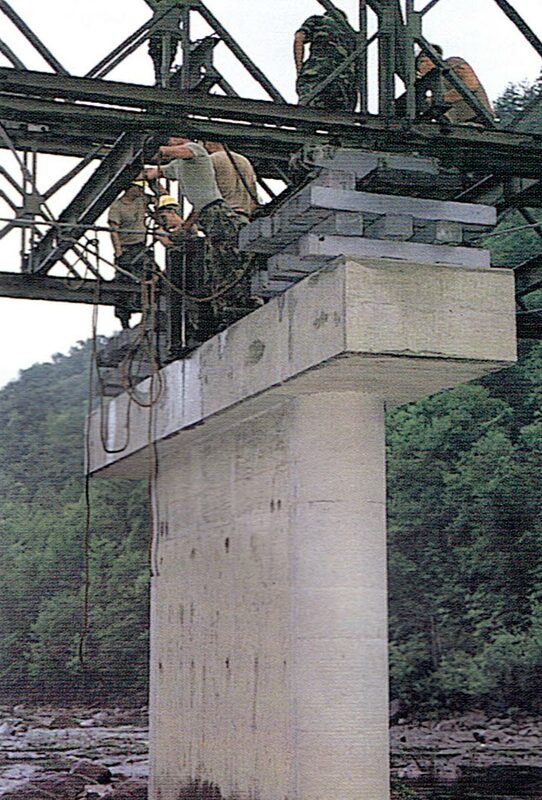 In addition to the state and the U.S. Forest Service, the project needed the approval of the Tennessee Valley Authority, which manages the flow of water on the Ocoee River through dam releases. Local officials wanted to play a role in the planning as well. Jim Sasser, then a United States senator representing Tennessee, remembers that persuading the Tennessee Valley Authority to participate was a lengthy process. Authority officials worried that water diverted for the Olympic course could adversely affect their ability to supply electricity to their customers. After the different local, state and federal agencies had agreed to participate, the state legislature eventually formed the Tennessee Ocoee Development Agency to coordinate their efforts and oversee management of the project. That move initially drew the ire of the community’s rafting business owners, who were concerned that the agency was given too much authority. Richard Fisher, who was a state representative for the area at the time and chaired the agency’s board of directors, said even with the taxing issue out of the way, bringing unity to the group was no easy task. Fisher said there was also some interagency rivalry between the Forest Service and the Tennessee Valley Authority that had to be overcome. 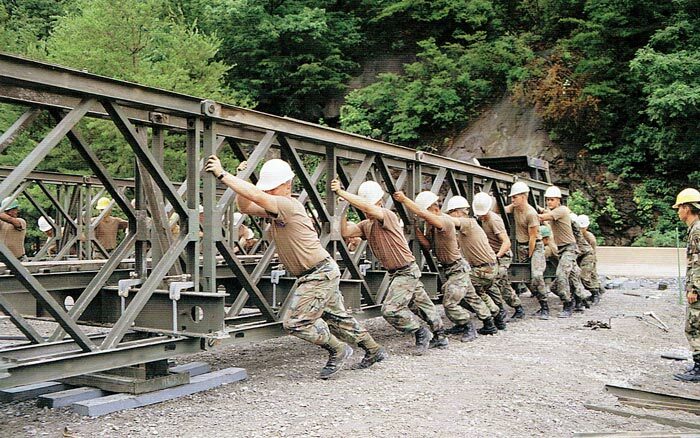 As an example of the turf battles between the federal agencies, Fisher recalled a walking tour of Cherokee National Forest in which a Tennessee Valley Authority employee became upset after seeing a Forest Service emblem on a bridge. “In the end, they did a very good job of putting aside their differences,” Fisher said. Paul Wright, the Forest Service’s representative on the committee, tried his best to keep the peace. At meetings, he handed “red atomic fireball” candies to “fire up” participants and read from “The Little Red Hen,” a children’s book with the moral that everyone who wants to share bread needs to participate in the bread making. Although the different factions began working together, there was still a collective lack of experience among the Tennessee Ocoee Development Agency’s staff in planning Olympic events. Even Parker Hardy, hired as the agency’s executive director, acknowledged a steep learning curve. “I had never seen a kayak race before and here we were, hosting what was then the biggest kayaking event at the time,” Hardy said. One of the most important decisions facing the group was where to locate the course. When the discussions began, many assumed the section of the river that was already being used by rafters and other paddlers would be suitable for the Olympic course. Upon closer examination, officials involved in the planning process determined that stretch of the river lacked sufficient areas for parking, spectator seating and athlete staging areas. Traffic along Highway 64 would also have to be restricted. Rather than live with those limitations, officials instead turned their attention to an area further up river as a prospective site. The so-called "lower" section of the Ocoee was used for the 1993 whitewater world cup as an interim solution, but work began in earnest on the course along the river’s "upper" section. There was a major problem with an upper Ocoee course, though: Since TVA’s primary purpose was to supply electricity rather than guaranteeing a year-round flow of water, that particular section of the river remained dry through most of the year. Water from TVA’s dam releases would have to be redirected down a new channel at speeds fast enough to make the course exciting for spectators and challenging for competitors. That required narrowing the channel so the water would move through it with greater force. John Anderson, a former competitive paddler and architect who helped design the course, said about 12,000 gallons per second needed to be released during the competition, enough to fill an Olympic swimming pool in 13 seconds. “Our design idea was to build a river within a river,” Anderson said. The course design required the riverbed to be narrowed and huge boulders to be added to create exciting rapids. An article published in The Commercial Appeal a few weeks prior to the event noted that the course alterations required about 60,000 tons of boulders and rock and 8,463 cubic yards of concrete. The same story pointed out that more than 230 trees and 500 shrubs were added along the course. The 1,362-foot course would drop a total of 27 feet from beginning to end, with tricky rapids along the way. Vance Travis, a local architect who worked on the project, said there were many details, large and small, that had to be addressed. Boulders in the river and along the shore had to be in the right positions, including some artificial ones with embedded cameras. Conduits to accommodate media cables had to be installed. BellSouth issued a news release prior to the event touting that a total of 66 miles of cable were laid to make the remote site accessible by telephone, video and computer. Steps also had to be taken to protect nearby Highway 64 from flooding risk. And the course was only part of the construction project. Workers would eventually have to build and install the bleachers, utility connections and all the other infrastructure needed to host an Olympic sporting event. All of that involved bringing construction vehicles and other heavy equipment up Highway 64, a white knuckle two-lane road that provided the only access to the area. Wright said the Forest Service also decided, after researching past Olympic venues, that a permanent building was needed to anchor the project. This building, known as the Ocoee Whitewater Center, remains in use at the site today. Hosting the event would also require a mini-Olympic Village, where the participating athletes, coaches and support staff would stay during the competition. Lee University in nearby Cleveland agreed to provide that service, which was an undertaking all its own. Jack Higgins, a longtime maintenance worker at the university, said electrical wiring, plumbing and water heaters on campus all got significant upgrades to prepare for the 400 athletes, coaches and support personnel who would be housed there during the Olympics. Also, Higgins said the university updated and expanded its cafeteria from 17,000 square feet to 34,000 square feet. University workers handled the necessary upgrades, enduring long working hours and tight security measures to complete their tasks. Parker Hardy, the Tennessee Ocoee Development Agency’s executive director, said those efforts were made more difficult because Olympic officials wouldn’t allow the use of their name on fundraising materials due to licensing restrictions. “We couldn’t use the O-word,” Hardy said. Lots of overtime work was required because the course needed to be ready for the U.S. Olympic team trials in 1995. “There’s seldom a government project that meets a deadline, but this was the ’96 Olympics,” Vance Travis, one of the course architects, said. Although the river course was completed in time to hold some preliminary events in 1995, other preparations at the site continued right up to the week of the Olympics, Travis said. This work included construction of the Ocoee Whitewater Center, installation of the spectator seating and other touches like landscaping that weren’t finished until the day before the events began. In preparation for hosting the Olympic events, the Ocoee Region Canoe and Kayak Association successfully applied to host several major canoe and kayak events held in the years leading up to 1996. Joellen Dickey, the association’s executive director, said these included the 1993 whitewater world cup, the 1994 U.S. nationals and the 1995 and 1996 Olympic team trials. These preliminary events, with participants from about 20 countries, helped prepare people living in the area for the experience of being Olympic hosts and volunteers, Dickey said. The Ocoee Region Canoe and Kayak Association raised money needed to cover the expenses of the preliminary events through corporate sponsorships by area businesses. The group also scoured the area for volunteers willing to train to work at the venue during events and also house the athletes. Dickey said many community activities were held in the area to raise awareness and generate interest in the upcoming Olympic events. At one event, the group recognized some of its corporate sponsors by asking company executives to don whitewater racing equipment and run through a simulated slalom course on the streets of downtown Cleveland. Polk County Executive Hoyt Firestone said the community was buzzing as the date of the races approached. After years of preparation, a pall was cast over the Olympics on the day the events on the Ocoee River were scheduled to begin. During the early morning hours of July 27, a bomb exploded at Centennial Olympic Park in Atlanta, resulting in the deaths of two people and injuries to more than 100 others. That reawakened fears of what happened during the 1972 Munich Olympic Games, when the Black September terrorist group abducted and killed 11 Israeli athletes. With the whitewater competition scheduled to start only a few hours after the Centennial Olympic Park bombing, no one was sure whether that attack was an isolated incident or potentially part of a larger scale terrorist plan. Security was already tight. According to reports in the Cleveland Daily Banner, up to 500 law enforcement agents from various federal, state and local agencies were working to provide security on the days of the events. Some were visible, some were stationed as snipers in the woods surrounding the course site. Lee University’s Jack Higgins said fences at the Olympic Village were reinforced with concrete, a double set of gates were built at the entrance and roadblocks were set up around the community. Olympic officials decided to go ahead with the day’s scheduled events in spite of the bombing, although delays were expected because of more intensive security searches. As it turned out, the races on the Ocoee started on time. According to newspaper reports, the edginess of the crowd became apparent when a bus backfired during a moment of silence for the bombing victims, causing many spectators to jump. Nevertheless, the races were held without any major problems. To cap off a day of uplifting news, American kayaker Dana Chladek won a silver medal. Meanwhile, the people of Polk and Bradley counties were doing everything they could to serve as good hosts. Parker Hardy, the executive director of the Tennessee Ocoee Development Agency, said about 1,800 volunteers were on hand to serve the needs of crowds nearly 10 times that size. To shuttle people back and forth from the remote course site, Hardy said 200 school bus operators were pressed into service. Nowhere was the Olympic presence felt more strongly than at Lee University, the home-away-from-home for the visiting athletes and their entourages. The Atlanta Committee for the Olympic Games provided many of the services available in the Olympic Village. According to the Cleveland Daily Banner, these included a bank and currency exchange center, hair salon, nursing service, massage center, gift shop, newsstand, shoe repair shop, dry cleaner, and exercise room. Athletes were also provided with pool tables and pinball machines to help them unwind and an on-call doctor to assist them with medical issues. The university’s recreation center was dubbed “The International Zone,” a place where athletes could watch television by day or listen to live bands by night. The university also provided the meals for those staying in the Olympic Village, which was practically an around-the-clock undertaking. The Chattanooga Times-Free Press reported that some of the athletes consumed 10,000 calories per day – an enormous amount of food for the university’s staff to prepare. Some of the more unusual items were served at breakfast, when fish, pasta and miso soup were popular requests. Jack Higgins described the clash of cultures between the locals and the people they were hosting. Higgins said the visitors seemed to be having a good time, though. One day during the competition, an exuberant competitor took his kayak for a few laps around one of the campus fountains, Higgins said. While the athletes relaxed inside the Olympic Village, the fences surrounding the university’s campus were covered in green tarp to provide them with some privacy. The three days of competition drew more than 42,000 visitors to the tiny community, according to the Chattanooga Times-Free Press. After Chladek’s silver medal performance, the American fortunes on the course took a turn for the worse. American Scott Shipley, at the time considered the top-ranked male kayaker in the world, failed to win a medal – as did the rest of his teammates. While the American athletes didn’t overwhelm their competition, American hosts did. The Chattanooga Times-Free Press reported complaints by athletes about their experience in Polk County were few and limited to minor things such as noisy garbage trucks and the distance from the Olympic Village to the river. The reporter from The Economist wasn’t the only one impressed with how smoothly the Tennessee operation had run. While Atlanta Olympic officials might have had some misgivings about allowing Polk County to host the kayak and canoe events, those were apparently forgotten by the time the events were over. “It was by far one of the best run and most beautiful venues,” Angie Ernst, event manager for the Atlanta Committee for the Olympic Games, told the Chattanooga Times-Free Press. 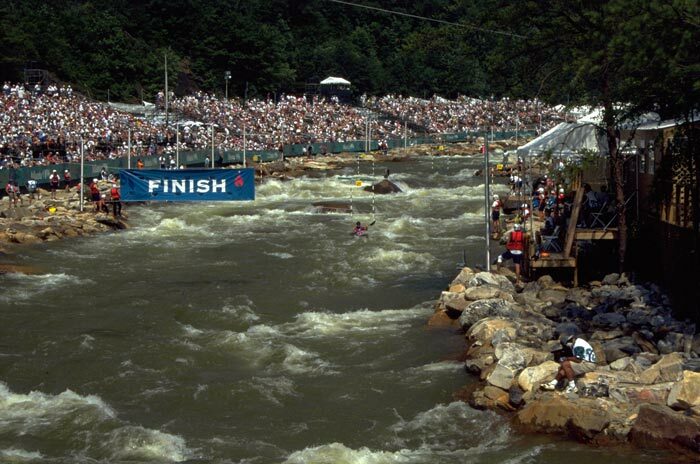 1996 Olympic whitewater events on the Ocoee River.